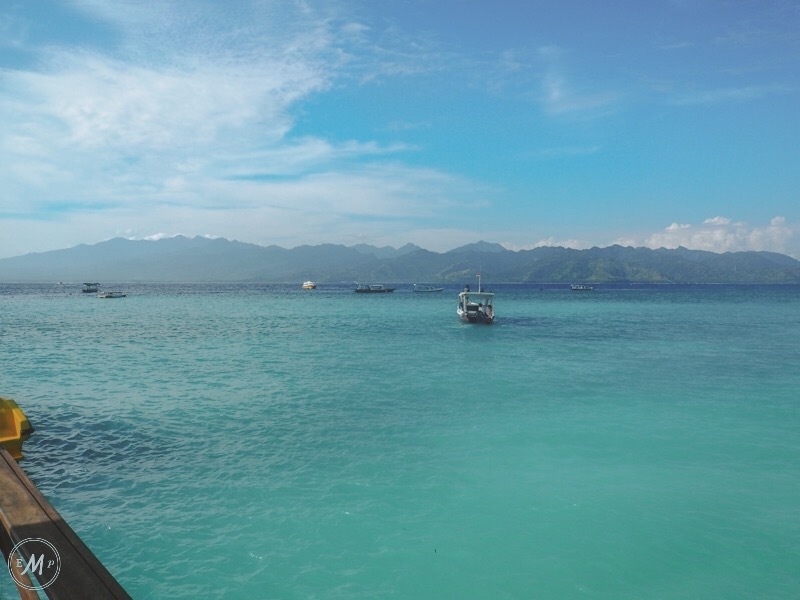 If you’re considering doing a Lombok day tour, it’s probably because your already staying on (or planning to stay on) one of the Gili Islands, which are a quick 20-minute boat ride away from Lombok. Therefore, it’s super easy to visit the island on a day trip from this location! I left early in the morning from Gili Trawangan to allow for a maximum amount of exploring! The staff at my hotel on Gili Trawangan: Villa Ombak were amazingly helpful and organised a boat to take me to the island (they even arranged for a local guide to meet me once I arrived). Most hotels will offer a similar service, so travelling to Lombok from the Gili Islands really couldn’t be easier. This said, it would be near impossible to travel to Lombok, for a day trip, from anywhere other than the Gili Islands, simply because it’s too far away from any of Indonesia’s other islands. There are plenty of other ways to get to Lombok if you’re planning on spending more time on the island. For example, you can take a ferry directly from Bali, or fly into the islands very own international airport, but for a day trip you really want to be coming from the Gilis! Compared to other islands in Indonesia, Lombok flies relatively under the Radar. However, I think the islands lack of ‘Instagram stardom’ simply adds to its appeal. Some even say that Lombok is Bali’s: ‘unspoilt counterpart’. Less populated than the tourist hotspot, but around the same size, I would have to agree with this statement after my Lombok day tip. Everywhere you look on Lombok there’s spectacular natural beauty. 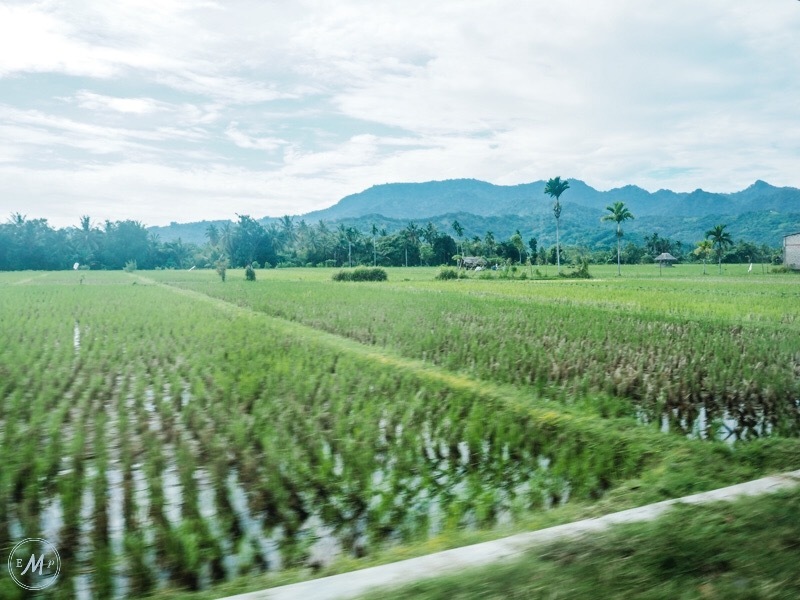 As soon as I arrived on the island I was blown away by the views… From the harbour I watched fisherman hauling in their morning catches on picture-perfect beaches, meanwhile (after hopping in a car) the island’s landscape quickly changed to that of endless green rice fields, and towering peaks. What’s more, there wasn’t another tourist in sight! Lombok owes its amazing landscape to the impressive Mount Rinjani, one of the highest volcanos in Indonesia, with a summit that reaches 3,726 meters above sea level. Just some of the views waiting for you on your Lombok day trip. 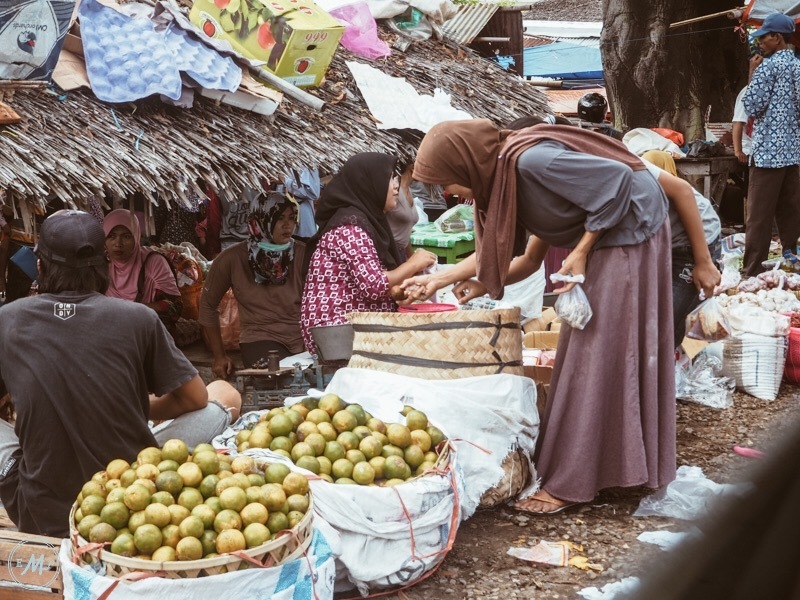 On my own Lombok day trip, the first port of call on my Lombok itinerary was Ampenan Market, a traditional market selling: fresh veggies, spices, fish and so much more. The market wasn’t actually on my original list, but my guide (Nurul) suggested a visit to get a taste of the island’s culture… And I’m so glad he did! Thus, I’d definitely say that its one of the best places to visit in Lombok. 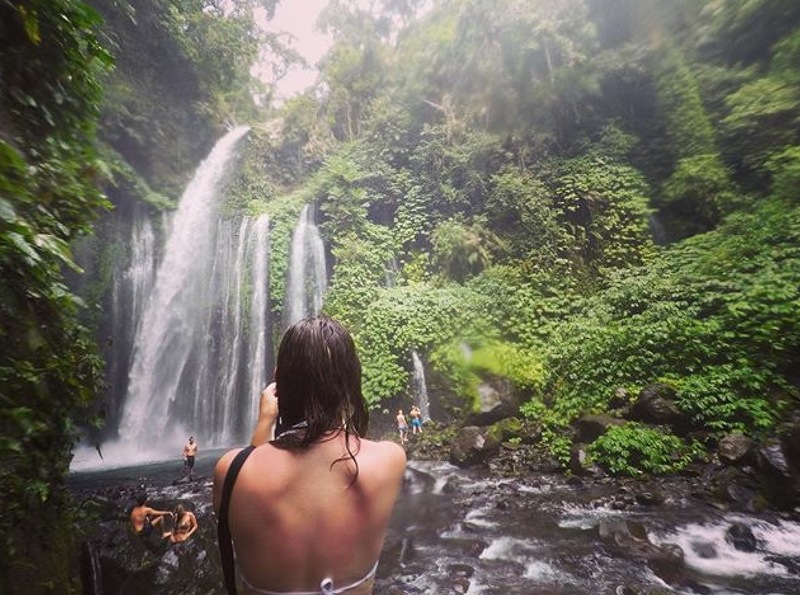 Without a doubt, one of the best places to visit in Lombok is the Tiu Kelep Waterfall. Located near the small village of Senaru, the waterfall is quite a drive from the islands main towns and costal areas. However, even when you’re only spending a day in Lombok, you should make the time for the journey!! Plus, you can’t really complain as you get to see a lot of Lombok’s beauty on the drive! Once you arrive at the sites car park, you’ll be asked to pay an 10,000 IDR (£1) entrance fee to enter the scenic area surrounding the waterfall. You’ll then get to walk through Lombok’s beautiful natural landscape to the waterfall. This path to the waterfall is well laid out, and pretty easy going! What’s more, about 15 minutes into the walk, you can take detour to a smaller waterfall: Sendang Gile. Seeing this waterfall alone would have been enough for me! But rather than take a break on one of the few tables dotted around its base, I decided to head onwards to the main sceptical: Tiu Kelep. This second waterfall is another 30-minute walk and is a bit trickier to reach as stone steps give way to a dirt path. There’s also several bridges and rivers to cross, as well as a bit of ambling over rocks. This said, I wouldn’t let this put you off! I don’t believe the hike is something an averagely fit person would struggle to do. SIDE NOTE: there’s no signage to Tiu Kelep and there are a few different forks in the path. I was lucky enough to have my guide with me who knew the way. You can, however, also hire a guide from the site’s entrance. 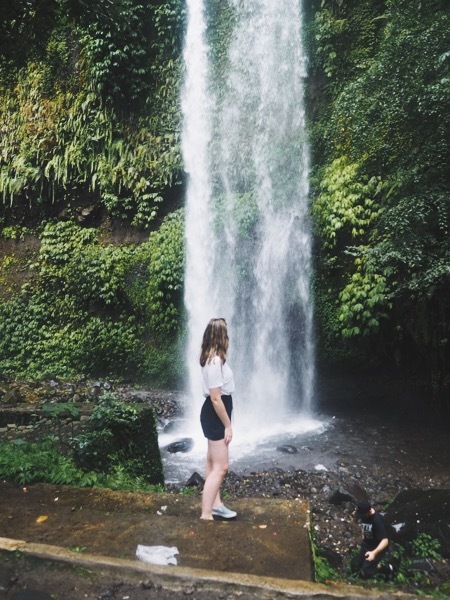 Colossal, yet seemingly gentle and all together breath-taking, the Tiu Kelep waterfall is certainly worth the hike, and its one of the best places to see in Lombok (maybe even Indonesia overall). I spent the majority of my precious Lombok day trip (around 3 hours) exploring these two waterfalls. Although I could have seen more of the island if I’d given the hike a miss, I have no regrets as seeing Tiu Kelep was something I’ll never forget and I would thoroughly recommend you add a visit to your own Lombok Itinerary. After a mind exploding time at Tiu Kelep waterfall, I didn’t have long left of my Lombok day trip. However, I was able to tick one more thing off my list of things to do in Lombok: visit a traditional village. Senaru Traditional Village, is only a short drive from the waterfall. Situated next to the Rinjani Trek Centre, the villages inhabitant’s are decedents of the islands indigenous Sasak people (who still make up about 85% of Lombok’s population today). For hundreds of years, these villagers have been seen as the cultural guardians of Mount Rinjani and its surrounding forest. Only connected to electricity 5 years ago, this Sasak village has maintained its ancient structure, with the inhabitants still living in traditional thatched houses. In recent years however they realised that they can capitalise on their rich cultural background. In this way, on entering the village you can step inside the villager’s homes, watch them prepare meals even learn ancient crafts such as weaving. The Sasak culture is fascinating and as a visitor, I definitely appreciated learning more about the people of Lombok. SIDE NOTE: There’s no fee to enter the village, although the villagers do ask for a donation when you leave (so it’s up to you how much you pay). Hiking isn’t everybody’s cup of tea. Therefore, when you tour Lombok for yourself, you may wish to spend your time on one of the islands many beautiful beaches instead of hiking to the waterfalls. I quickly stopped at Senggigi beach on my way back to the harbour and I’d say that this soft sand beach, lined with palm trees, is the perfect place to spend a relaxing day in Lombok. Senggigi is also the ‘tourist hub’ of Lombok so there’s no shortages of restaurants and shops to explore nearby as well. Other, even more picturesque, beaches in Lombok you may consider visiting include: Mawun Beach, and the so called ‘Pink beach’ which is located near to Ekas Peninsula, and surprise surprise it has pink sand! So when it comes to beaches, you’re really spoiled for what to do in Lombok! That pretty much summaries the things to do in Lombok in a day. Although I had a truly magical day (and one I’m not likely to forget) in Lombok myself, I did feel slightly cheated of time. Amongst other things, I would have loved to have joined a trek up Mount Rinjani, as there’s said to be the most breath-taking views the whole way up. There’s also hot springs, an exquisite crater lake, and the best sunrises in Indonesia. Many say a visit to Mount Rinjani is probably the best of all the things to do in Lombok! However, the trek takes at least 3 days, and its therefore not possible to do when you visit Lombok day trip. Therefore, when planning your own Lombok Itinerary I highly suggest staying on the island for a few days. There’s simply so many amazing things to do and places to visit in Lombok that a day isn’t enough! 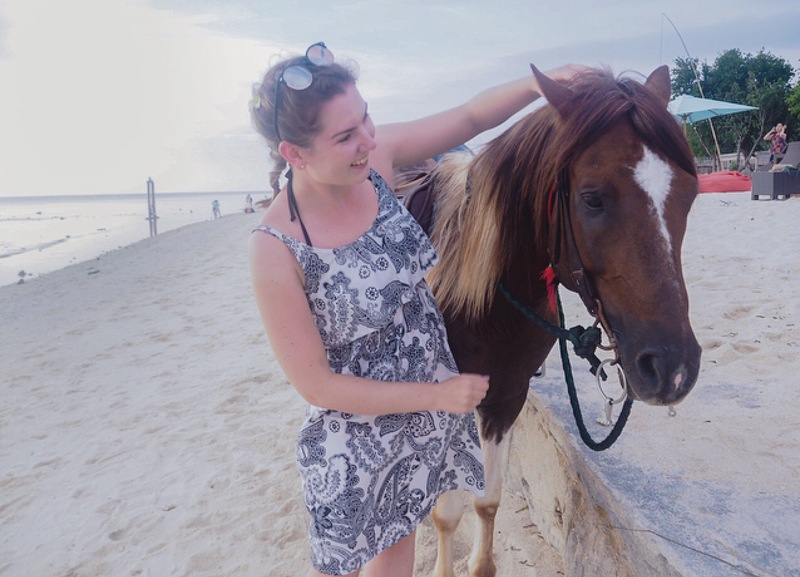 But, if like me, and a day trip is all you can squeeze into your Indonesian trip then I hope this post helps you make the most of it! Wow how awesome is that trip!! The waterfall looks amazing! I went to Lombok to visit friends (at Gili Gede) and missed all of this! Would love to go back to do everything you recommend! I visited Bali fir 2 weeks and had so many activities planned that I never made it to Lombok or Gili. When I plan my trip to Indonesia, I am definitely adding this to my travel list. That waterfall is so magical, loved reading the minute details. I love all of the waterfalls you found! I’m heading to Ubud in a few weeks and was looking for day trips to take. Thanks for this great guide! “Before touching down in Indonesia I had never even heard of Lombok.” I also had never heard of Lombok! Until reading your blog post, that is! It looks and sounds like a really neat place to visit. Hope I can make it there myself sometime. Thanks for sharing your insights! 🙂 This is such a beautiful place! You could spend the morning at the market and enjoy a picnic at the waterfalls! Lombok seems like a perfect place! I am going to Bali very soon but unfortunately only for 5 day so I won’t have time for any day trips! But hopefully Ill get to go there one day for longer! I love those waterfalls! They look amazing! Looks so beautiful! Swooning over those waterfalls! I’ve never heard of this place before! The markets look amazing. I wish we had true markets in my town. 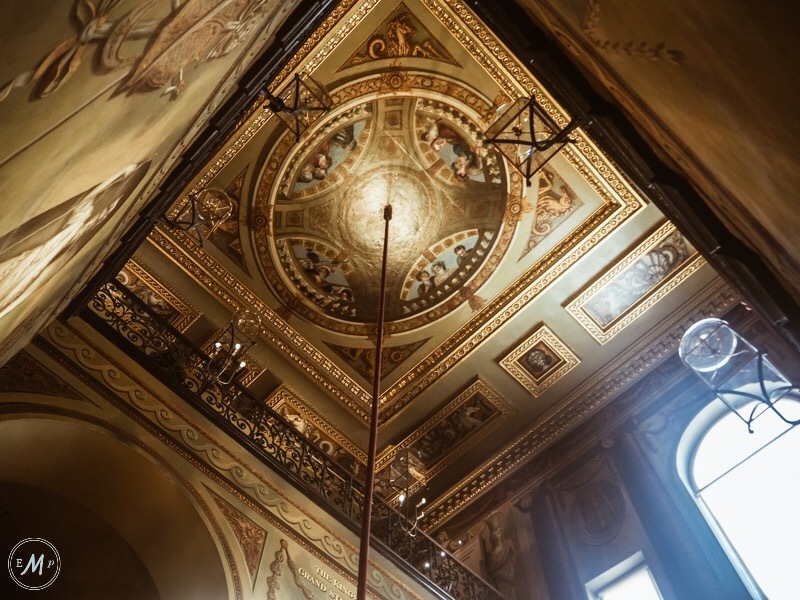 Wow, this place is stunning! I’ve heard so much about the area but I’ve never really looked into it. I’d love to hit those markets with all the fresh fruits and vegetables. Obviously, I could spend all day at the beaches and waterfalls. Great place to relax and unwind. Omg what a traveler’s dream to visit such a place! I’d love to roam through the market, looking at all the veggies and fresh fruit. Wow! Lombok seems astonishing and really worth visiting. 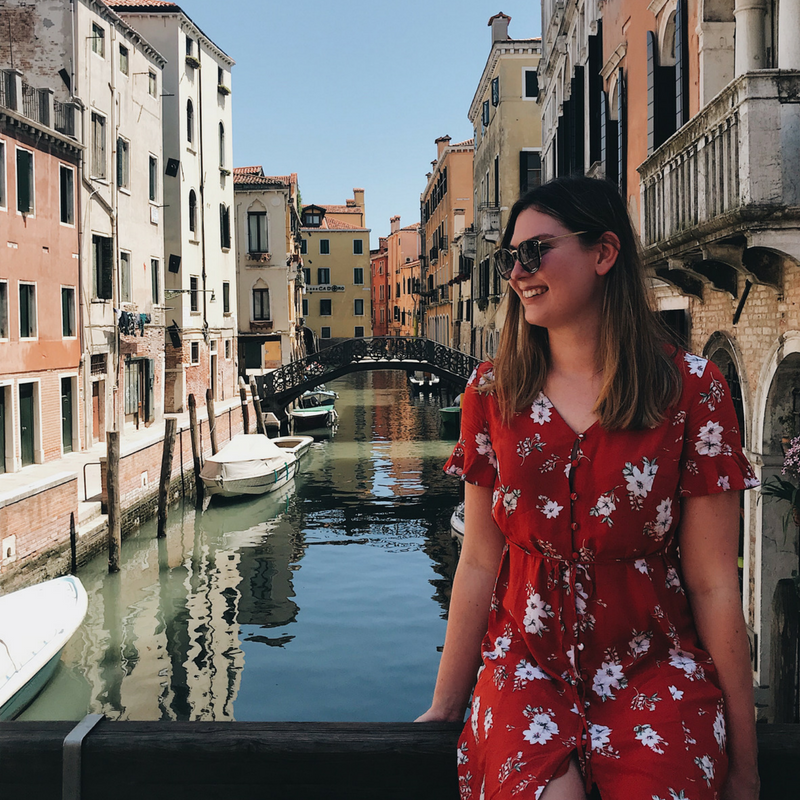 Thanks for the inspiring post and detailed itinerary! When’s the best time of the year to go there? Thanks for reading 🙂 I visited early June and think that is the perfect time! Its just after the rainy season so the humidity is so intense!! Unfortunately, I don’t have his contact details, but I’m sure you’ll be able to find your own guide if you speak to your hotel/a tour company!